You know how things are. If you don’t pick up the phone right now, and at least call me to chat about your family portrait, you will probably get swamped with other things, and forget all about it. Then, before you know it, a year - two years - five years have gone by. How different will your family be then? You see, time is ticking.... and it’s never going to stop. First, Your Child Takes His or Her First Step. Next, Learns To Ride A Bike. Later, Gets A Driver’s Licence. Graduates From High School. Gets Married. Starts A Family Of His or Her Own. Don’t put this off. You know how life is. We put things off, and before we know it, everything has changed. If your life is half as crazy as mine is, year after year you find yourself frustrated at the things you wanted to do, and never got done. A family portrait is something you deserve. Plus, You Will Save 50% By Acting Right Now! What does that mean? All you do is call me to chat. I’ll answer all your questions about family photography. I’ll send you your 50% off certificate. 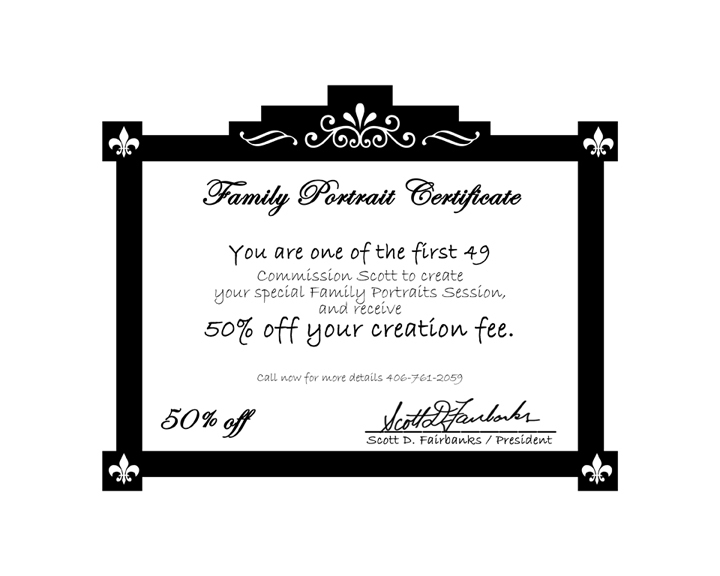 If you decide to have your family portrait created by me, you may use this certificate to save 50% off the creation of your images! It’s that simple! CLICK HERE to see a copy of the certificate I will send you! Now, I’m not talking about a “snapshot” that was taken during a family outing on the Fourth Of July. I’m talking about a wonderful photograph, created by a professional photographer that not only captures your family’s true bonds and relationships, but also does so in a way that you’d be proud to display openly in your home for the rest of your life. It’s Not Too Late. This Moment, Right Now, Can Be Held Onto For The Rest Of Your Life - For You To Share With Family And Friends. You don’t have to make a big decision right now. You don’t have to choose your photographer - you don’t even have to decide that now is the time for your family portrait. Just take one small step toward holding onto your family’s happiest moments RIGHT NOW. Just Call My Studio, And We’ll Chat. And, Remember, If You Decide You Want Me To Create Your Family Portrait, Save 50% Off It’s Creation. It’s All Up To You. Once again, CLICK HERE for my studio number, and you can call any time. If I don’t answer, just leave your name and number at the beep, and I’ll call you back. If you’re thinking of this family photograph as a GIFT FOR SOMEONE, let me know, so when I call back, I only ask for you, and don’t spoil the surprise! P.S. - Remember, call me just to chat, and if you’re one of the first 49 people to do so, I will send you a CERTIFICATE FOR 50% OFF the creation of your family portraits! There’s no cost, and no obligation for this chat. Your family portraits shouldn’t be trusted to any photographer who doesn’t realize what a responsibility it is to make sure these portraits are perfect. These are your memories - don’t trust them to just anyone. You’ve nothing to lose, and so many great memories to gain. Call my studio now - no cost, no obligation - CLICK HERE TO CALL ME (no cost, no obligation)! P.P.S. - STILL NOT READY TO CALL? That’s okay. I can still give you some more secrets FOR FREE in the mail. If you’d like more information about family photography rushed to your mailbox, simply CLICK HERE to have more secrets rushed to you.